Hamelyn is a hostile Breton bandit wizard living in Honningbrew Basement. 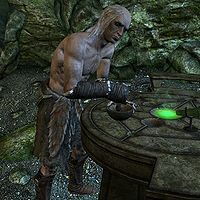 According to the journal he carries, he was imprisoned in Whiterun for ten years, having been called a "madman", but escaped and enrolled at the College of Winterhold as an apprentice alchemist. There, he writes, his instructors beat him because they were jealous of his genius, and he was expelled. He is breeding an army of Venomfang skeevers, in preparation for his day of revenge, and has discovered that the ingredients available in the meadery are perfect for the task. However, his skeevers are also being exploited by an unhappy meadery employee as part of a plot to get rid of the meadery's owner. He wears some fur armor with matching bracers and a pair of Imperial light boots. He also carries two leveled potions, one of restore health and one of restore magicka and a random piece of enchanted jewelry, with a chance of additionally carrying a leveled ingot and/or a small amount of gold. He can cast a leveled selection of spells from the Restoration, Alteration and Destruction schools. This page was last modified on 5 January 2018, at 02:21.